Take a look at the above picture of northern Africa – the Sahara Desert, to be specific. In this article, I’m gonna tell you how this picture will unveil your greatest UX challenge as of today (and probably for the next years to come too). And, why you are most likely trying to solve it the wrong way. In this article I’ll try to share some thoughts on a very high level of conducting User Experience work (and by high I mean sort of an upper level/bird’s eye view of the hierarchy of the organization you’re working with/for) – thoughts of something that I’ve been trying to prepare my UX students on Nackademin for, in the Design Thinking courses I held earlier this spring. Because, by the time they finish the program and throw themselves head-first into the industry, I’m 100% certain they’ll stumble into this issue very soon. OK, so what is this ”something” – and how could it possible be connected to the Sahara desert? Fair question. First, let me explain the picture of Sahara. 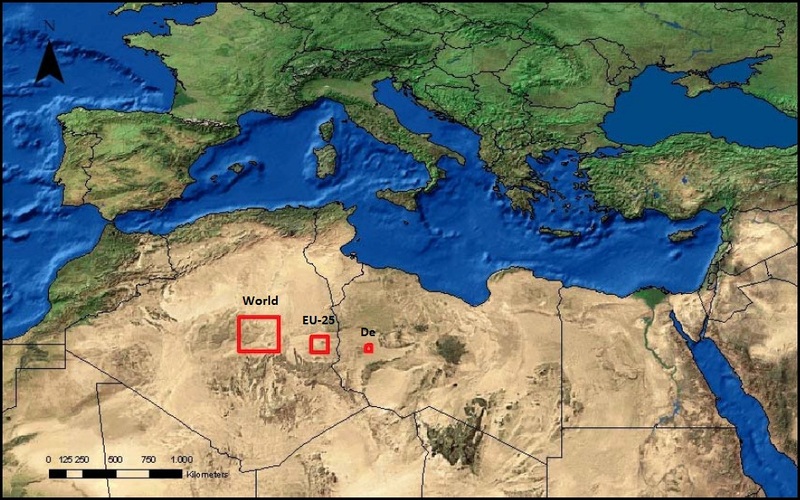 The three red rectangles shows how much of the Sahara desert that would have to be covered with solar panels, in order to provide all electricity required for (from left to right); the whole world, the European Union, and Germany. ”Desertec” is the name of a big initiative, aiming to provide clean and secure energy from renewable sources. The initiative has been supported by lots of scientists from around the world. Without going into too much detail, but just to explain some of the story behind it, a german particle physicist named Gerhard Knies made a very interesting conclusion back in 1986. His calculation showed that in just 6 hours, the world’s deserts receive more energy from the sun than humankind consumes in a year. Let’s stop here for a moment, and just think about that. 6 hours in total – generating more energy than we could consume for a whole year. Now, based on this calculations – and while trying to not to go further into the complicated details that of course follows when you try and discuss the whole world’s energy problems, I would argue that in fact, we – the world – doesn’t really have an energy problem at all. According to the calculations (here’s another article in Forbes by Mehran Moalem on this), it would take some 1% of the whole Sahara to be covered by solar power plants, in order to supply the full need of electricity of the world. Imagine that. What’s really interesting here is actually this – if we already have access to technology that could solve our entire energy problem, while simultaneously solving the climate crisis often described as ”the greatest challenge in modern human history”… then why don’t we just do it? I bet you know the answer. Here’s my whole point with this article. It’s not spelled ”lack of technology” or ”lack of resources”. It’s spelled ”politics”. ”Let’s try and apply this metaphor of energy consumption challenges onto your organization. Are the user experience’s delivered in your product or service the best possible ever? If you try and apply this metaphor onto your own organization, then what does it tell you? Is the greatest UX challenge of your business (very often connected or even equivalent to your business’ overall digital challenge) really about UX? Or could it maybe be connected to internal politics…? OK I’m not gonna try and be too subtle here, or hide my own personal opinions. To be honest – from my 12 years of professional experience working with design and UX – it’s almost solely political issues that’s been preventing me and the people around me, from performing and delivering the best possible outcome. Yes, I’m serious. Internal politics within organizations – usually with little difference of wether it’s a smaller startup, or a big, international corporation. It’s so very common that organizations spend lots of resources on setting up an organization model where different teams & units are supposed to be autonomous and self-controlling. Or, to spend the same resources on hiring external agencies or consultants (like myself). And then, ultimately, the management – or someone on the mid-level hierarchy, sent out by management – still turns up at the day of release and changes everything to something more likable to themselves. 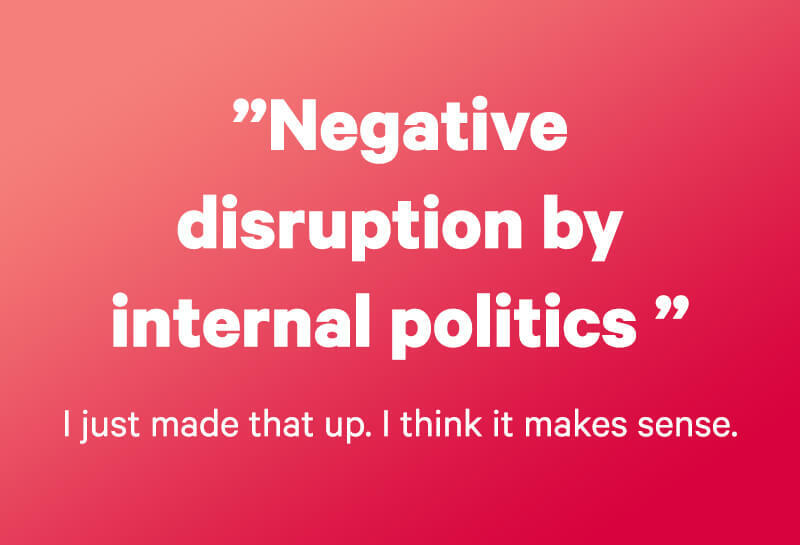 This sort of ”negative disruption by internal politics” can be expressed in many ways – usually by top-down control of someone higher up in the hierarchy, or by upper management itself. Or, by split up silos within the organization, where every department and every employee is fighting only for their own cause, not seeing the bigger picture. A lack of a unified vision. This lack of vision is much harder to solve than most people think. Of course it helps to actually have a vision at all. But to implement it within the organization, motivating people to follow it and to work together instead of pulling in different directions, is connected to lots of smaller problems. Simply put – people want to look good at work. They want to show that they have competence and skills; and they usually do this by forcing their own opinions on the work that passes them by. I’m not throwing any blame here – we’ve all been guilty at some time (though some of us are actually guilty most of the time – which is what you should now start to try and change). However for an employee, keen on performing well for the upcoming salary discussion, I think the issue is usually bigger than for an external consultant who just works for a set hourly rate. So – have you started to change your mind about what is actually your greatest UX challenge of today…? Is that challenge really a practical ”thing” within the operational, day-to-day research & design work, trying to produce the ultimate digital product/service? Or, is it maybe something much more abstract – something subtle happening in the meetings, by the desks and in the corridors of your organization? Internal politics is of course deeply connected to the culture of an organization. The pyramid in the image above describes the relation between the functional level in, for example, a digital user interface – and the pleasurable level that can only be reached by fulfilling the functional and usable levels first. So for example – if we were to follow the thesis in the pyramid above, and then started by trying to make something usable, even though it doesn’t actually work on a functional level to start with – then you can expect it’s pretty sure doomed to fail. If we think of an organization, or a business, where the foundational culture & internal politics isn’t working very well to start with… or, one that is just not open or committed to adaptation or change when it comes to UX work… then, any work put in on a lower, operational level (corresponding to the ”usable” or ”pleasurable” level in the pyramid) won’t reach much success. At least not any way near its full potential outcome. Far too often, we try and solve problems in the wrong way in our UX work. Endless polishing of the website won’t make up for a far too complicated product. This is where the line between more common ”user experience” work, and the somewhat upper-level ”service design”, gets floating. Personally it’s a demarcation that I find quite uninteresting. I don’t believe that it’s possible to conduct efficient UX work, without looking at the bigger picture in a combination of user centered needs, organizational needs, and technical feasibility. Let’s get back to opinions. Opinions are self-centered. Good user experience work is human-centered (sometimes referred to as ”user centered”, ”people centered” etc). There’s a huge difference here. Trying to explain the full scope of Human Centered Design and Design Thinking would unfortunately take too much time (my ”Human Centered Design” course for UX students is 6 weeks long and that’s still quite short of time). Let’s just settle for now on that a Human Centered approach should be the core of all of your UX work. And if you’ve heard this expression Design Thinkingbefore but didn’t exactly understood what it was, then yes – Human Centered Design is the approach your projects and organization needs to implement Design Thinking. Or Design Doing, as it’s also getting referred to. The tricky part here, is that not spreading your own, self-centered opinions around is really hard. It’s actually one of the main aspects that qualifies a really good UX designer – to constantly be able to distance yourself from your own opinions & bias, and instead look to other people’s needs and perspectives, and translate these into good digital interfaces – for example. To avoid being a opinion-person might be hardest for the people situated in the middle of the organizational hierarchy. Those people who feel the pressure of delivering results upwards (to management), and from this pressure feel that it is their responsibility to share as much feedback as possible downwards. Some even seem to believe that the person with the most opinions win the game – that your job itself is having opinions. This thinking is something you really have to try and remove from your organization, if you are serious with trying to adapt to a Design Thinking approach and modern UX work routine. Because that’s an old, non-modern mindset that comes from the old, industrial world idea of ”experts”. 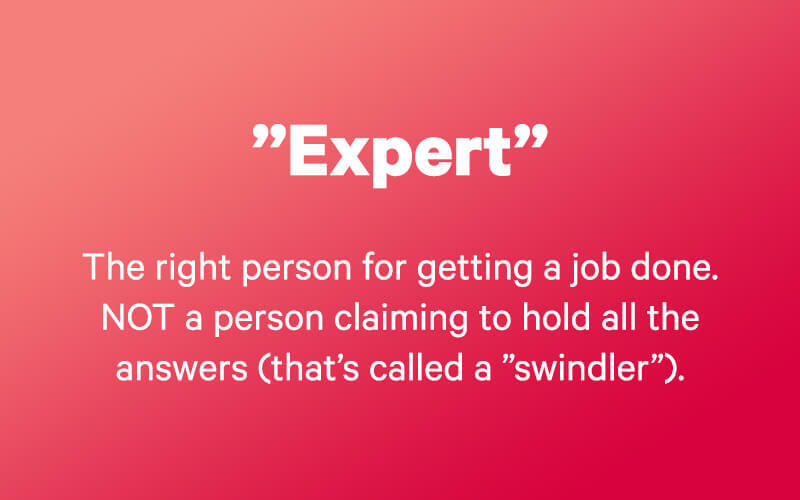 My own idea of an ”expert”, is that it is the right person for getting a job done. A qualified person able to make good guesswork and with proper competence and experience. However, an ”expert” does not mean a person sitting on all the answers. If there was a world where we had such persons available – then we wouldn’t really need scientists, right? Because then the scientist’s would already know all the answers. But they don’t. That’s the whole idea of science. You perform it, and then you iterate and refine, to reach a better understanding of things. I believe that the same goes for any expert, in any field. So, the belief that a UX designer (or any designer whatsoever) would be able to sit on all the answers for designing the best possible interface from the start – is just a big, yet extremely common, misunderstanding. There’s design principles, platform guidelines, statistically well-performing design patterns and so on – but those aren’t equal as answers to what you actually should design. Let’s all unite on that fact together right now; UX design without UX research, isn’t really UX design. It’s just some kind of weird, unconscious design. Random guesswork, at its best. What’s also common (you’re probably doing it yourself quite often), is trying to disguise your own opinions as something representative for lots of people. In essence, portraying your own self-centered arguments as if they were actually somewhat human centered – based on several people’s thoughts. But deep inside, you know that’s not true. However, we must understand and remember that most of us aren’t doing this by intention. It’s often happening on an unconscious level – simply because we often believe or feel that it is expected from us to provide our own opinions, and pushing them through. Not having an opinion could make us look ”dumb” – and that doesn’t look good for the upcoming salary discussion, right? It’s such a vast problem if you look at it from some kind of bird’s eye view. Fellow designers are just one of all the professions where ”mutual admiration societies” normally appear. Praise – or critique – is being thrown around at each other’s as if it was an inflated currency. I often find it funny at its best, but even more often actually disturbing, when attending different kind of design reviews where I’m expected or asked to give feedback on other people’s design – and people really expect me to push my very own, personal designer ”likings” on the design being reviewed. It should be thought of completely different. Any designer doing a design will always make that design differently from the rest. As with anything any human being would do. I definitely don’t mean to say here that everyone should do what they like. There’s lots of good methods and approaches in Design Thinking for example, on how to streamline design work on a cross functional level. Design Studio is one of many great methods to reach a consensus around design, while still preserving the integrity and creativity of each individual involved in the process. No, what I’m aiming for here is that outside of the best practice textbook example’s, the world is still mostly filled with people who are pressing their own opinions above other’s (and by other’s here I mean both their colleagues, but even more importantly above their users & target groups). When I see someone else’s design, and is being asked to give feedback, then instead of grasping the moment to live out my personal design likings, I try and think in terms of this; ”what is the suggestion of least change that I could give here, that would cause the best impact or outcome?” That’s actually back again to the core mindset of Human Centered Design and Design Thinking itself. Some have learned to use this approach for making Minimum Viable Products, or Minimum Viable Product Experiments (MVPe = i.e the most simple prototype you could make, that would still fulfill its goal(s), whether it is explaining an idea, or testing a function on a user and so on). It saves the designer a lot of time and let them focus on what they do best. The above leads to that the employer/client also saves a lot of unnecessary money that could be spent on lots of better things than moving pixels around, or swapping colors back and forth. Finally, the usual outcome from giving too much continuous and hard critique to someone, is just lowered self confidence – which will never lead to anything constructive or efficient. Instead, small guiding hints and advices have a much higher chance (in my opinion) to let the receiving person learn on their own – ultimately providing higher motivation and better circumstances for creating innovation. Oh my god, are you guys still reading? I’ve actually been writing on this article since January. Not a guarantee for that it’s really gotten better by that, though. The article can speak for itself. Richard has a lot of great thoughts on how to structure your business on a both operational and strategic level. It follows the idea on how to build a succesful, modern and digital-friendly organization. But it also summarizes the needs for any organization, for it to be able to fully encompass the essence of what is Design Thinking.Myself, I believe that the best results & outcome in any UX work (any work ever really) will come from a harmonic business culture where internal politic is never allowed to dominate the day-to-day work, nor the decision-making processes. The whole idea with Human Centered Design and Design Thinking is that it should be cross-functional. That means that all competences (or at least all the relevant ones) in an organization should be part of the creative ideation around products & services, and how they are being exposed and communicated. Try and remember this picture of the Sahara. If you already have your 1% slice of the Sahara – I mean, if you already have the necessary components for a great outcome (for example, great people with the right skills for their tasks) – then don’t ruin it on the way with your organizations internal politics. No one really likes politics anyway. Find your business’ corresponding 1% of the Sahara Desert, then just get everyone to work on building those damn solar power plants. And avoid starting your own world war around how those solar plants are going to look, who’s gonna build the grid, who’s gonna get all the electricity, etc etc etc… Make it a routine into looking for other people’s different perspectives and needs. And have a really clear decision making process that everyone knows in advance. That’s really all you need to get seriously started with UX, Design Thinking, Digital Transformation, you name it. I promise. I’ll write more about it in my next article (which is hopefully sooner than in 7 months).